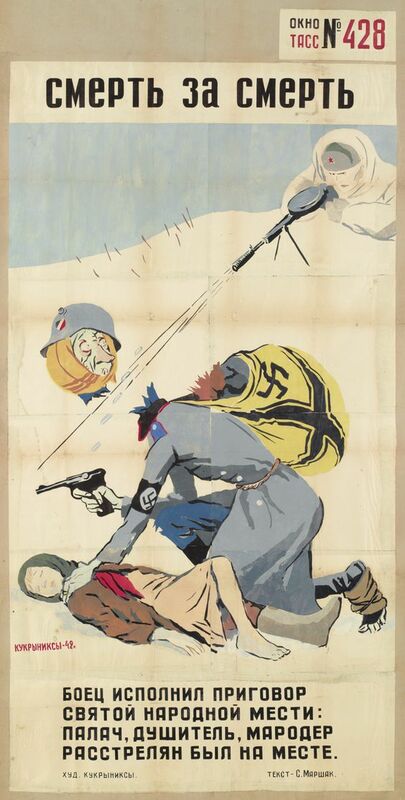 Every combatant in World War II had its own unique style of propaganda posters. 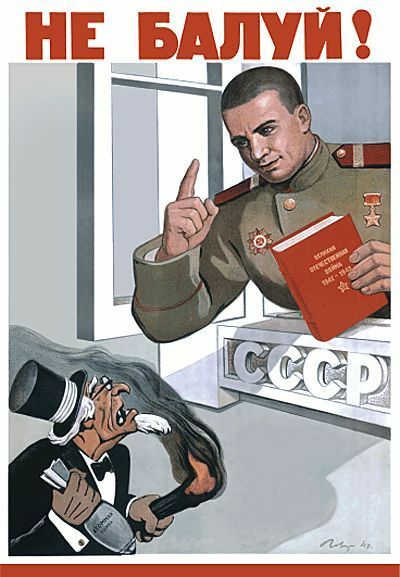 The Soviet Union's posters are the most unique because, unlike the others, they don't really try to tell the people to do anything specific, such as to enlist or to keep their mouths shut for fear of alerting German spies. 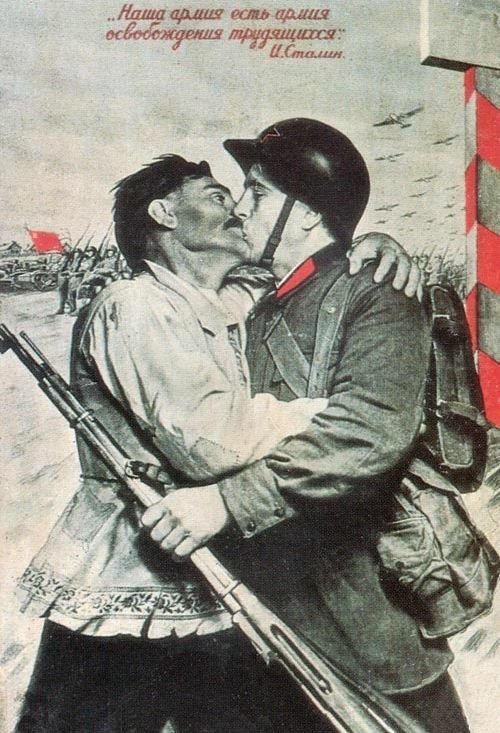 Instead, Soviet propaganda posters simply convey feelings and emotions. 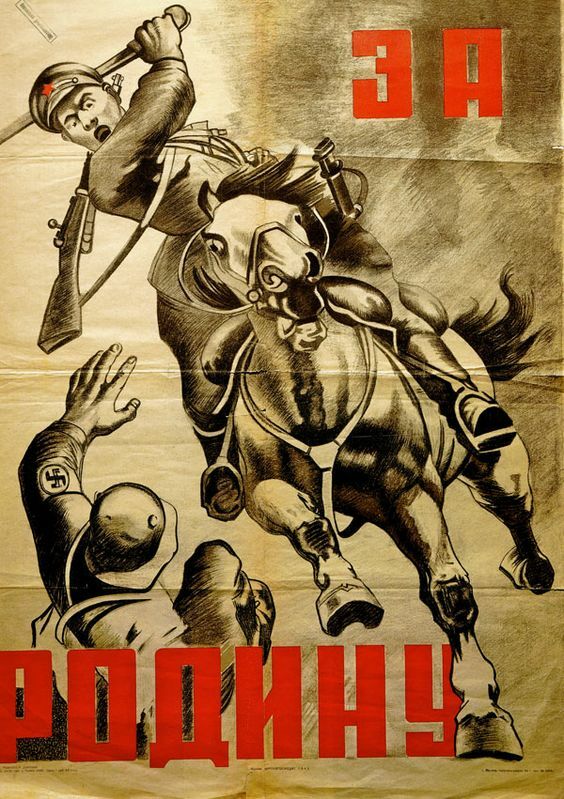 However, make no mistake: Soviet propaganda posters of World War II are not "simple." In fact, they are intricately crafted to convey interlocking themes which provide individual links in a continuing dialogue with the people that has only one conclusion: Germany must be defeated. 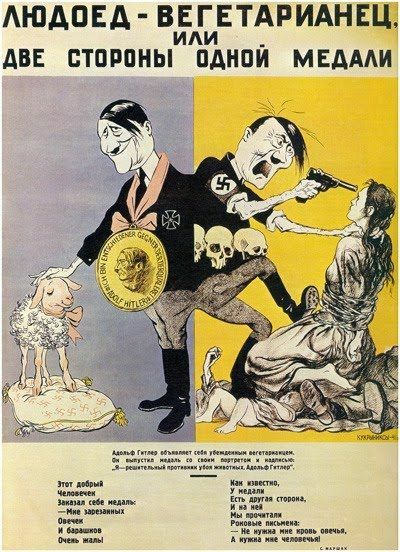 The way that basic themes are used to broaden the attack on the Germans by firmly establishing one theme (such as that Hitler is a two-faced), then using that theme to establish something completely different (that all Germans are two-faced thieves) as an outgrowth of the first, is brilliant in its simplicity. Soviet posters are best thought of as establishing a thematic progression. 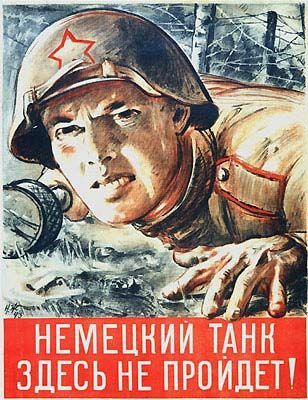 If you view the right Soviet propaganda posters in succession, they almost form a graphic novel of the emotions of the leadership (and presumably people) of the USSR throughout World War II. Let's give it a go. 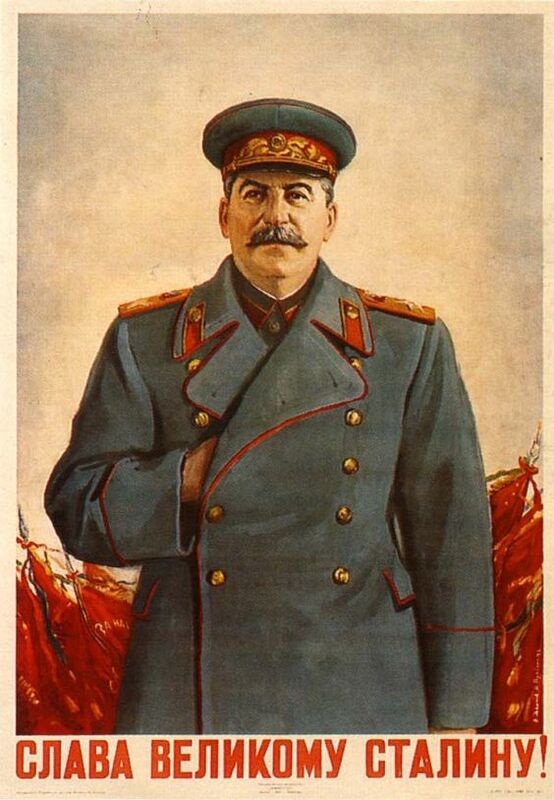 For instance, glorification of Soviet Premier Josef Stalin is a major and basic theme of Soviet posters. This was a durable theme which extended into the immediate post-war years - and the abruptly disappeared when he did. 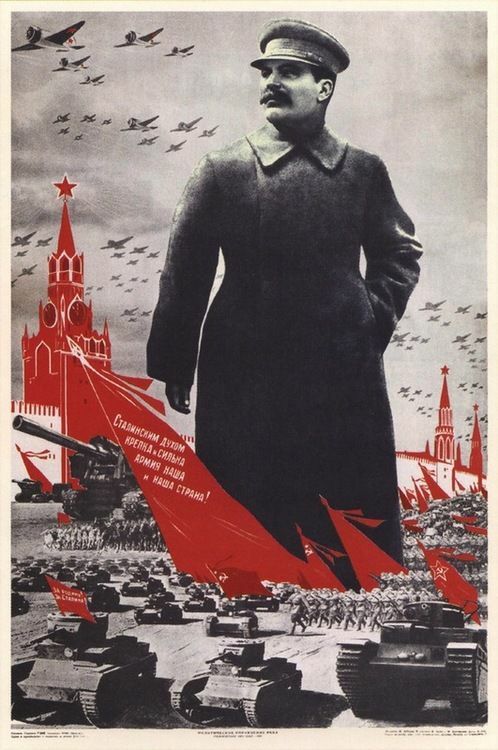 Stalin gave the disparate peoples of the Soviet Union a common center around which to rally. Hitler is portrayed as the flip side of the glorious Stalin, and the contrast is obvious. 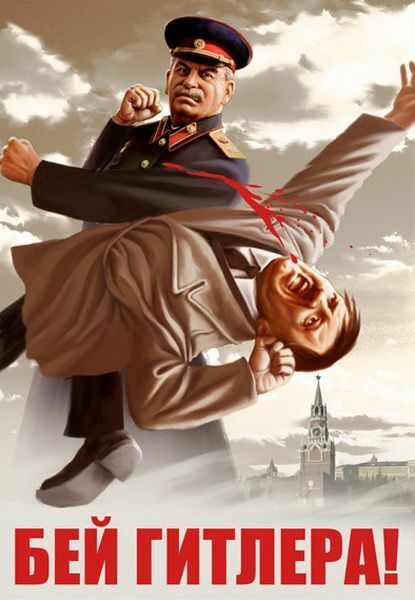 Whereas Stalin is all heroic poses and determined gazes, Hitler is shown not as an equal national leader, but as bloodied, beaten and tormented beast. 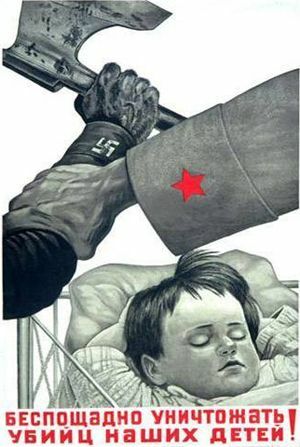 Hatred of Hitler thus is established as another major theme of Soviet propaganda posters. Hitler invariably is depicted as a ghoulish and animalistic, or a feeble, tired old creature who faces a quick and well-deserved reckoning. Soviet posters then expand upon the depiction of Hitler as personally evil. They portray Hitler as two-faced, posing as kindly and gentle when in fact he secretly is brutal and insane. 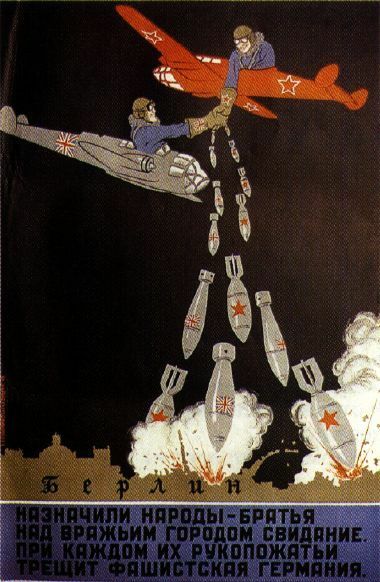 This is an example of Soviet posters expanding upon an original theme to create a completely new theme. This theme of Hitler being two-faced with a deceptive appearance is extended to Germans in general, without specific reference to Hitler. This extension colors all Germans with the tar of Hitler himself, creating another completely new theme. Having portrayed Hitler as two-faced, well, so are all Germans. In fact, they literally are wolves in sheep's clothing - like Hitler. 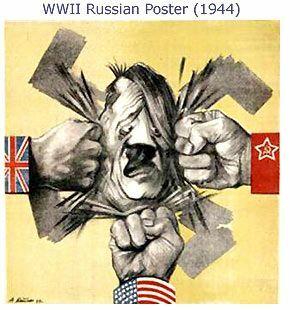 Hatred of Hitler also segues into another major theme of Soviet propaganda posters, collaboration with the Western Allies. 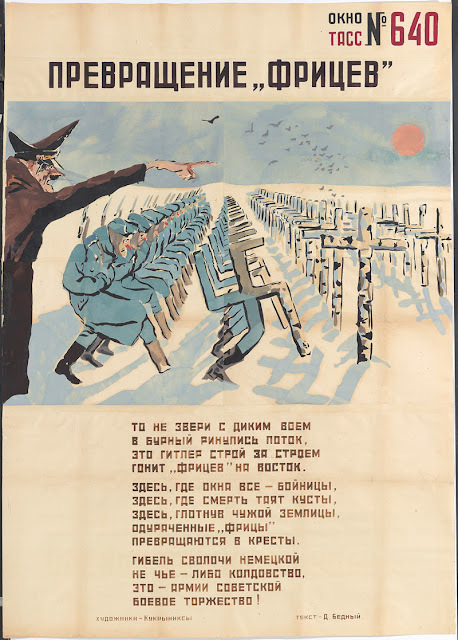 Having established that the Germans are actually demonic and barbarous despite trying to appear otherwise, another strain of Soviet propaganda posters simply cuts to the chase and shows all Germans as cruel and barbarous without any complicating factors. This all hearkens back to the original depiction of Hitler as brutal and barbarous, and is used to extend into other completely new themes. 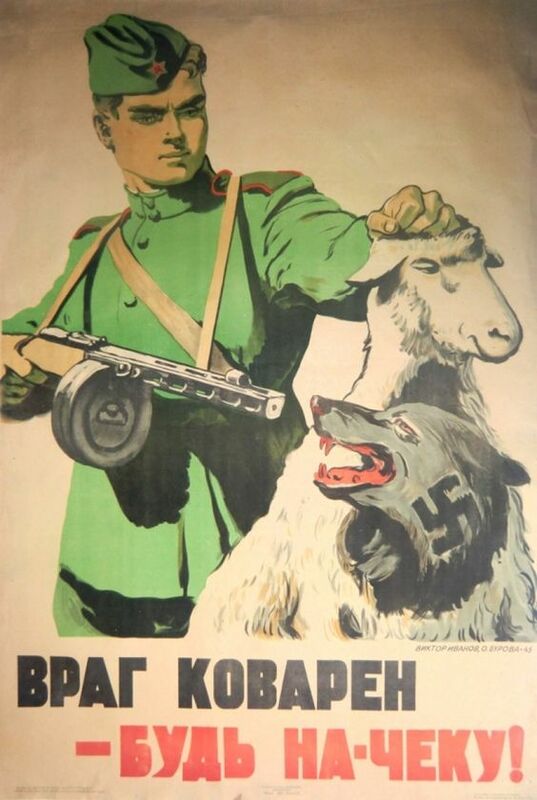 The poster above, for instance, combines the theme of brutality with another common theme, German thievery. It is not just thievery, though. 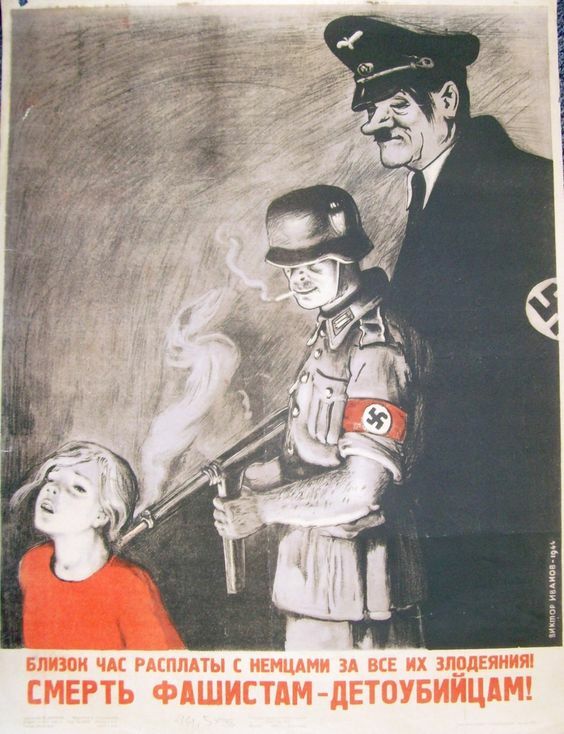 Below, Hitler approvingly watches over the shoulder of all Germans committing cruel and inhumane acts, cementing the connection of a bad Hitler = bad Germans. The German cruelty extends to every form of barbarism. 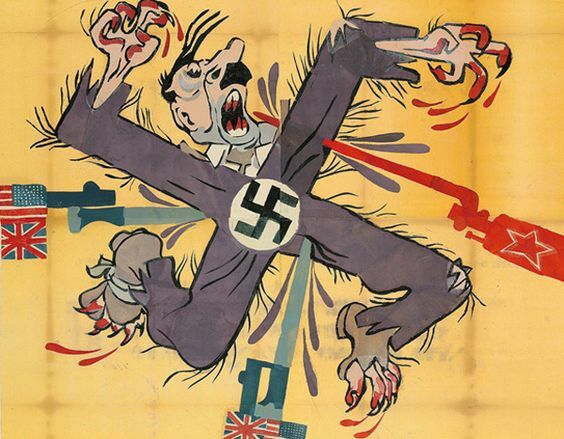 The Germans are depicted as wild, ape-like savages who must be put down. Who is there to stop these wild predators, these thieves trying to steal the fruit of the people's labors? Why, the Soviet Red Army, of course. 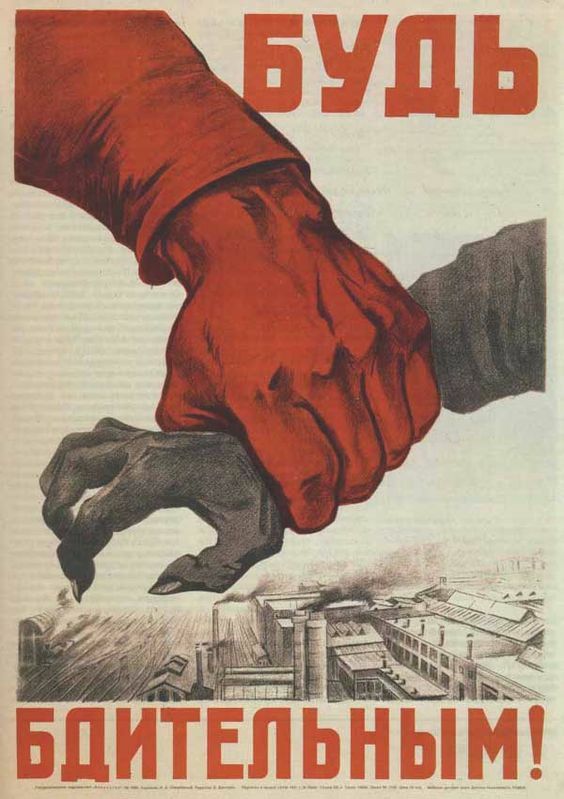 The mighty Red hand will stop the grasping claw of the German thief! 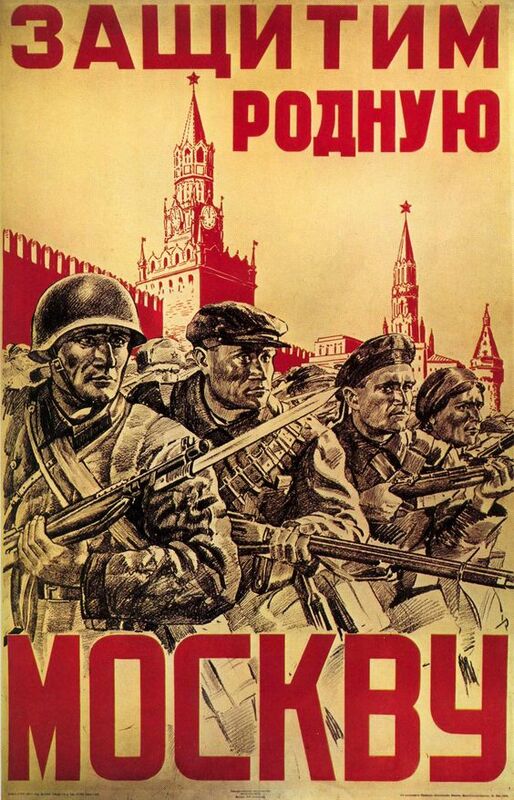 The Red Army, in fact, is all that stands between the Germans and civilization itself. The Red Army also is the only thing standing between the horrible Germans and unspeakable horrors. The Germans come on endless hordes, but only to their graves. 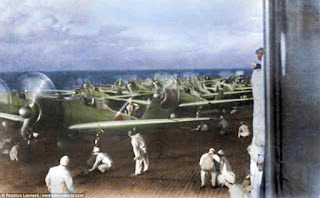 However, never fear: the Red Army will put the savage beasts to flight! 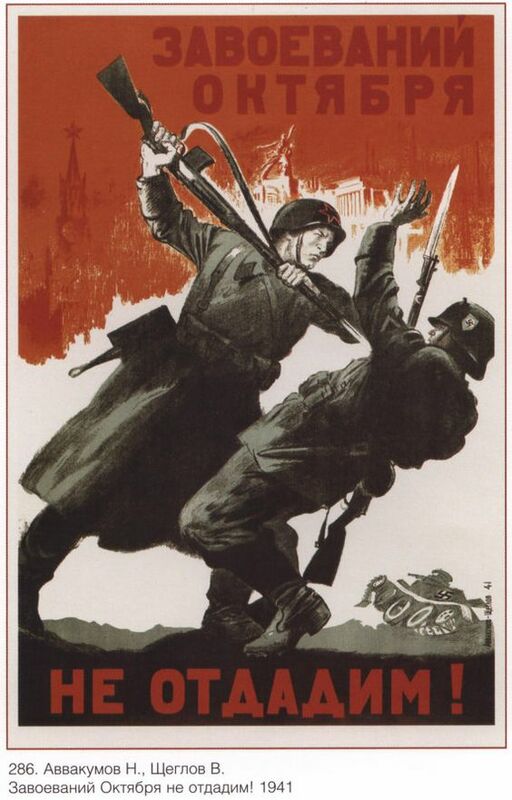 In fact, the unstoppable might of the Red Army will smite the Germans like a thunderbolt - along, of course, with the background help of the Allies. The victory will not be won by mere abstractions, however. 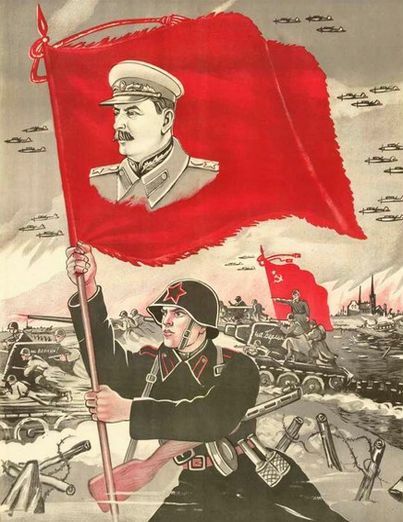 The Red Army will accomplish the victory by direct action against the hated invader. The traditional weapons of the Soviet Union are sufficient to slay these savage German beasts, who actually are weak, feeble and helpless. This is all due, of course, to the heroism of the individual Red Army soldier. 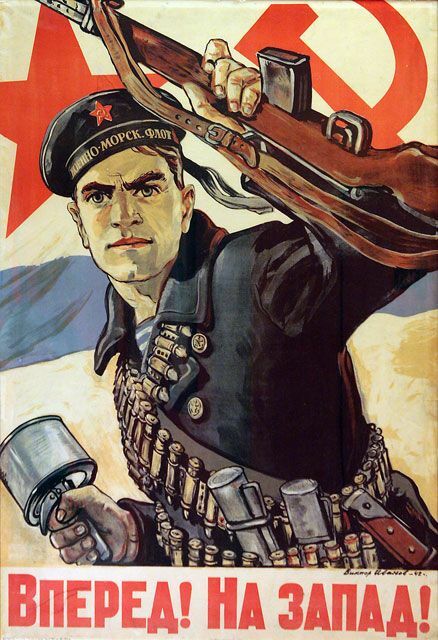 Red Army soldiers are portrayed as tough, undergoing privations, but getting the job done by their sacrifice and valor. This fine fellow is not drinking any old water. 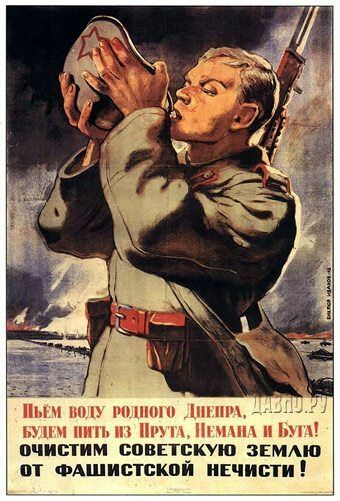 He is drinking from the waters of the mighty Dneiper River which the Soviets (in the scenes behind him) are finally crossing in 1943 after two years behind it. This was considered an especially glorious feat by those who accomplished it first, and they all became Heroes of the Soviet Union. 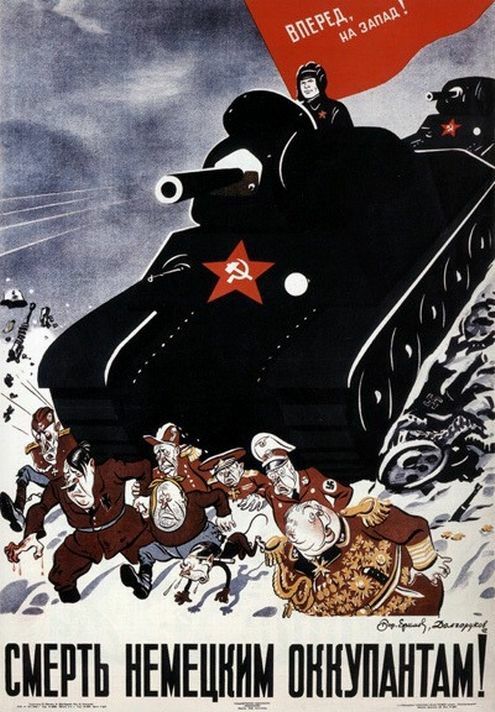 The glorious Red Army soldier will stop the barbarous German tanks by whatever means necessary. 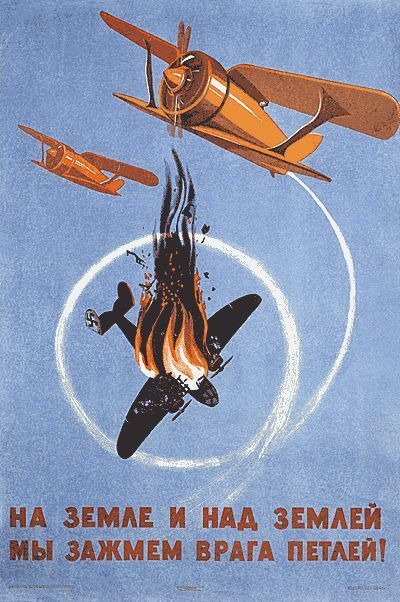 The mighty Red Air Force literally will fly circles around the Luftwaffe because the black German planes represent evil, while the lighter-colored (and, incidentally, obsolete) Soviet planes represent good. Good will triumph over evil despite our primitive weapons, because there are more of us! The images are simple, the subtext is not. 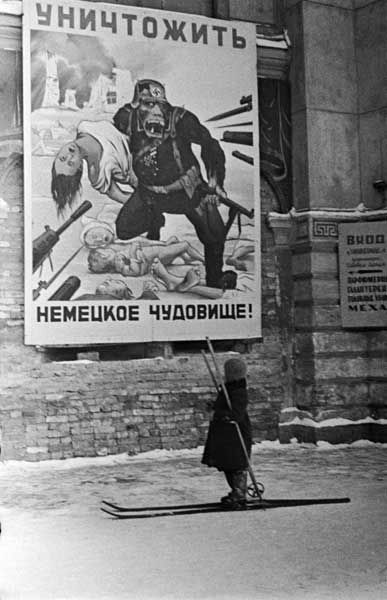 The job of the local civilian is to support this effort of the brave Red Army warriors. Below, a man in native garb (apparently Ukrainian) is so happy to be rescued from German servitude that he kisses him. All of this is possible by people working together, including the peoples of the Soviet Union, England and the United States. 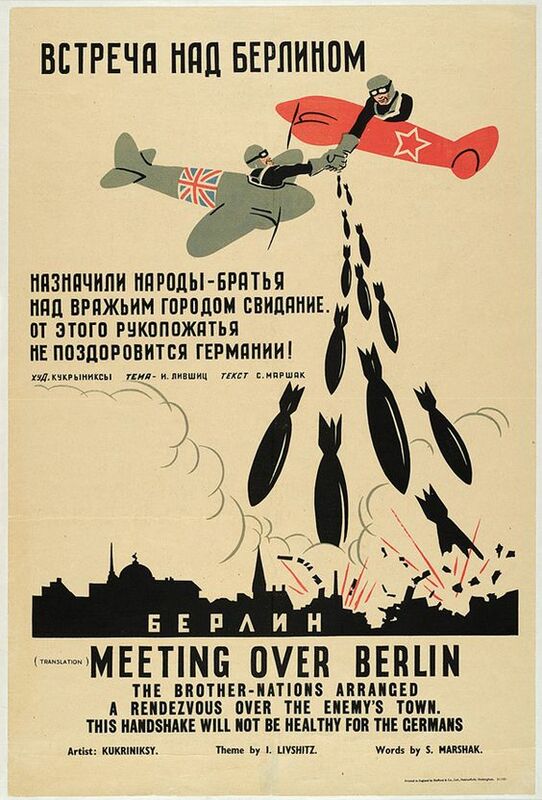 The most obvious example of this cooperation is in destruction of the hated German capital by Soviet and English bombers. 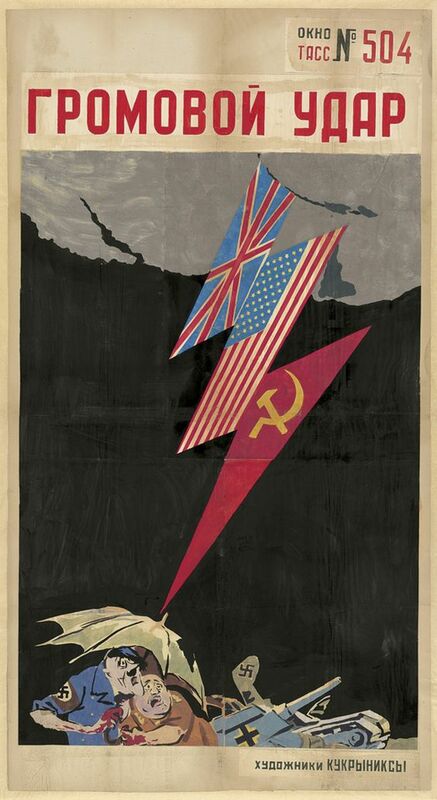 These posters sometimes hammer the point home even further by putting part of the written message - which itself is unusual in Soviet propaganda posters - in somewhat stilted English. 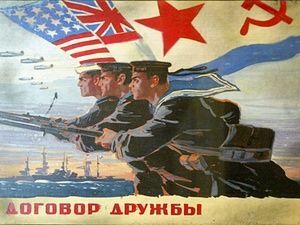 The use of the English sentences in posters designed for home consumption, such as the one below (obviously styled in imitation of western film posters which Soviet citizens would instantly recognize as American) further illustrates how "international" the effort is without really adding anything to what the picture itself says. But, friendship and cooperation only goes so far. Now that the war is over - behave!